Iran coach Carlos Queiroz pleaded for equal treatment after his side overcame difficulties posed by cancelled friendlies and Nike’s refusal to supply boots due to US sanctions to beat Morocco 1-0 in their World Cup opener. Aziz Bouhaddouz’s 95th-minute own goal sparked wild scenes of celebration from the Iranian players and fans in Saint Petersburg as they claimed only their second-ever World Cup win. Greece and Kosovo cancelled scheduled friendlies in Istanbul during Iran’s pre-tournament preparations and Queiroz had criticised Nike’s decision to stop supplying boots just before the tournament started. “We come here without World Cup preparations. A couple of teams don’t want to play against us. 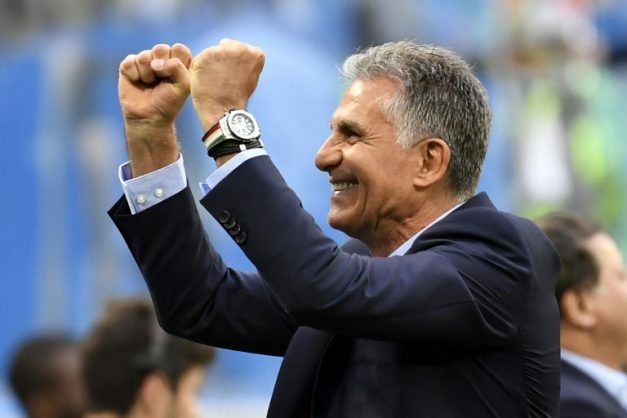 We don’t have camps, we have problems,” said Queiroz. The former Real Madrid coach has had to deal with all manner of difficulties in his seven years in charge of Iran and reiterated his call for a more equal playing field. “No pitches, no camps, no friendly games, sanctions, so I think it is my duty to say in front of you guys: ‘just let these guys play football’. “They just want to express themselves and play football. We are in this World Cup under the umbrella of FIFA, (which) is to put politics apart and that is not what is happening. They showed today they deserve to be treated like all other players.